A modern pantry can be a very useful part of a kitchen. Different homes may have different pantries and there are many pantry ideas that can keep you organized. No matter the design or size, all pantries serve the same purpose: to store items and reduce clutter in your kitchen. A pantry can be a completely separate room for storing gadgets, dry goods, kitchen supplies, and more. It can also be a few shelves in a kitchen that are used to store packaged foods, spices, and other edibles that don’t belong in the fridge or freezer. Either way, keeping your pantry neat and organized will help make it useful and easy to find what you need. Finding the right kitchen organizers for each item is a good place to start. There are many food storage options, from plastic containers to glass jars or classic candy jars, that are practical, stylish, or both. Decide what works best for your family, pantry space, and food needs, then start organizing! Some foods, such as canned vegetables, are best stored in the containers they come in. Others are often better off transferred elsewhere. Cereals, for example, will go stale if the cardboard boxes aren’t always closed perfectly, but will last much longer in tightly closed plastic containers. By moving foods that come in oddly shaped or soft packages, like pretzels, into sturdy containers with defined sides, you can also save space and make your pantry less messy. Make sure to label and date foods you remove from their original bags and boxes. The kind of shelving and storage you choose will depend on the space you have available. If you have a very narrow space, you might need to use open shelving, for instance, while roomier spaces could get by with doors. Another option is user-friendly pull-out pantry drawers that transform the average cupboard into a well-organized drawer. These allow you to see the contents of a drawer without having to root around in the back. Products like Rev-A-Shelf are rather easy to install in existing cupboards so you can avoid a complete kitchen makeover. Baskets are also a super useful organizing tool and usually pretty budget-friendly too. Wire shelving is also inexpensive and allows you to add height to your pantry. Even a wire shelf attached to the inside of a door will give you a little extra storage space. Sure, it’s great to buy in bulk if you can, especially if you have a large family. But don’t just buy multiple boxes of food because it’s on sale. The food may go bad before you get a chance to use it, bulk-sized containers can produce more food waste, and having too many jars, boxes, and cans can take up valuable pantry real estate. If you do buy in bulk, make sure you prepare a storage space before you bring a ton of stuff home. Also, be sure to have labels ready for anything you repackage. Just because your pantry may be small, it doesn't mean you should neglect its style. The decor doesn't have to be elaborate or expensive, but even the simplest touches can make searching a well-organized pantry more pleasant. Wallpaper allows you to really personalize your storage space and can provide a fun pop of color. If you don't want to mess with real wallpaper, explore the design options in removable wallpaper or contact paper. It's easy to hang and the style choices available today are immense. Plus, when you're ready for a change, it's easy to take down for a quick and inexpensive makeover. You can also paint behind the shelves. 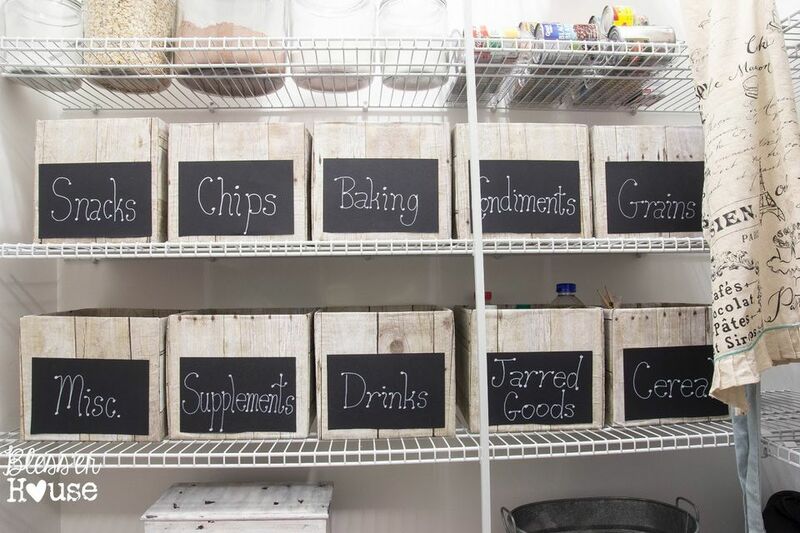 Chalkboard paint on the inside doors of a pantry is fun and useful, too. Use the wall for a running list of grocery items, notes for your family, or just a silly place for the kids to draw. If you have a large pantry, storing your appliances in the pantry will save valuable counter space in the kitchen. This is the perfect place for a stand mixer, slow cooker, or other large appliances that you only use on occasion. You could also store oversized or oddly shaped baking dishes on higher shelves in your pantry. If your house doesn't have a pantry, but you are craving the storage space, consider building a pantry. There are many possibilities, from a traditional closet-like pantry to innovative designs for the smallest of spaces. 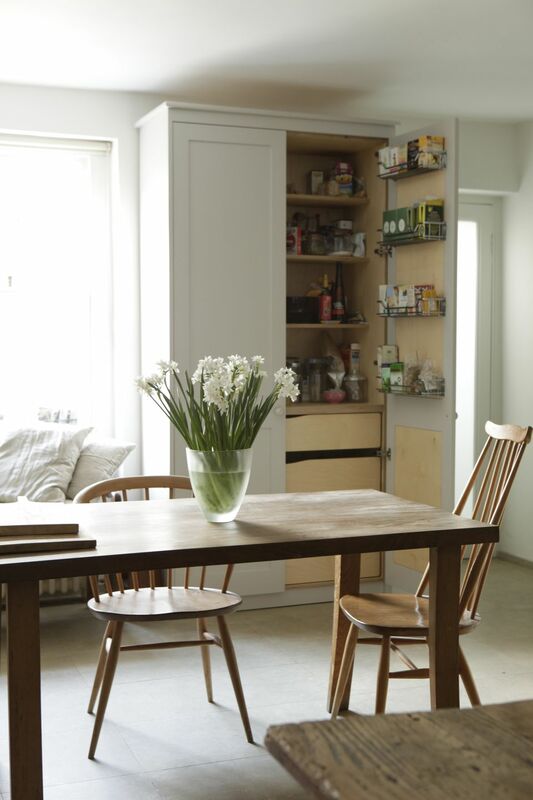 Think about any usable space you have in your home, then brainstorm ideas for transforming it into a useful pantry. For instance, you could repurpose the famous Ikea Billy Bookcase to into a pantry, take over an underused closet, or make a pantry space in a different area of the house, like the basement.